Macs are very productive machines and we all spend at least 8-10 hours daily working on them. Getting an insight into how we spend time on our Mac can go a long way in showing us how productive we really are. We all think that we manage our time in the best way possible and we don’t waste it anywhere unknowingly. But the fact is that we all lie to ourselves when it comes to accounting the time we spend. We lie because we have never attempted to truly track it. Unfortunately the Mac does not come with an inbuilt tool to track the time which you spend on it. However, there are a lot of third party software (apps) which can help you track your time accurately. I downloaded and used many such apps over time and in my usage found the following two to be the best of them. 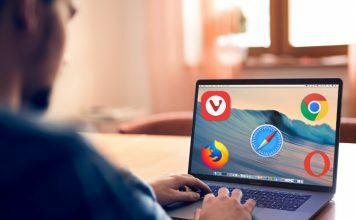 One of the biggest reasons Macs are considered as productive machines is because of the quality of apps available on the platform. Mac apps help us perform actions which otherwise would not have been possible. Mac apps tend to stay in the background while letting you do your work. Timing is one such app which quietly lives in the background, tracking every minute you spend without bothering you. Once launched the app lives on the menu bar and records the time you spend on different apps. Not only that the app is so good that it can even track the individual windows, files, and folders opened by you. If you are working on multiple documents, it will show you the time you spent on individual documents separately. You can tag your work and assign them to different projects. This will allow you to track the time you spend on each individual projects. There is so much more you can do with this app. One of the simplest features of this app which I love is the productivity scores it assigns based on your work. 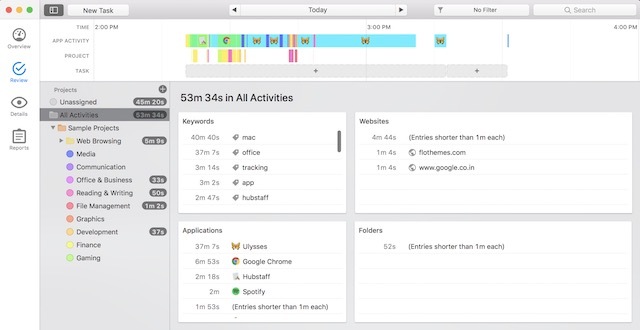 This allows you to see your productivity just at a glance. Don’t be surprised to see your productivity stats hovering between 50 to 70% when you use it for the first time. I cannot begin to explain how much I have improved my productivity since I started using this app. The app is rather costly but comes with a free trial period. Use the trial period before you decide to purchase the app. 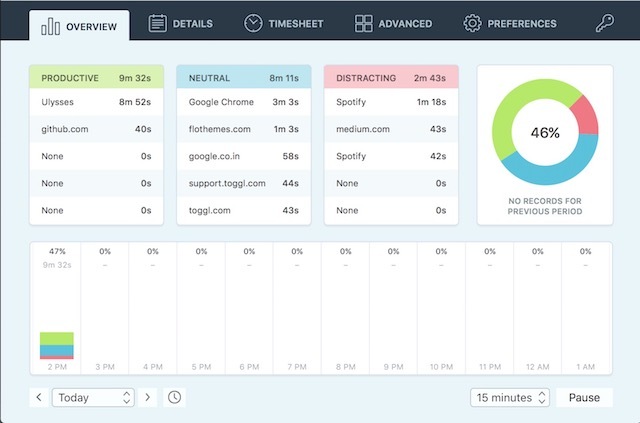 Another good app to use if you want to track time spend on your Mac is Qbserve. Just like Timing, when launched the app lives in your menu bar recording all your activities in the background. Apart from showing the amount of time you spent on each app it also lets you see what you were doing at any given time of the day. The time log is maintained for every 10 minutes giving you a very detailed view of your day. One feature I love about this app is the productivity stat it presents on its menu bar icon. 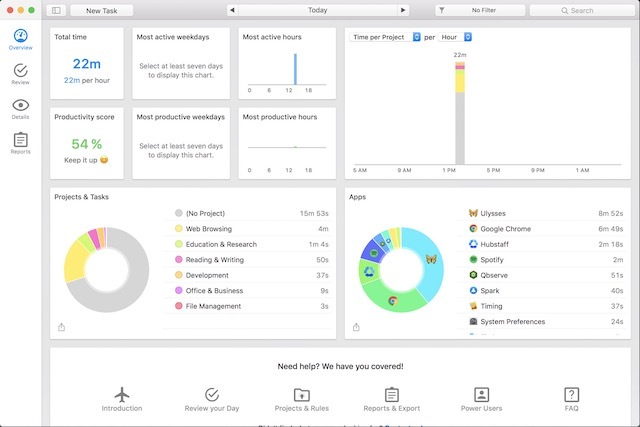 You don’t have to open the app window to see how productive you are. It acts as a gentle reminder whenever you productivity starts dipping below. The productivity stat is also colour coded and changes from red to green as your productivity percentage increases. This app is also good for freelancers who are paid on an hourly basis. You can create projects and assign your work to specific projects. This way you can accurately measure time spent on each project. 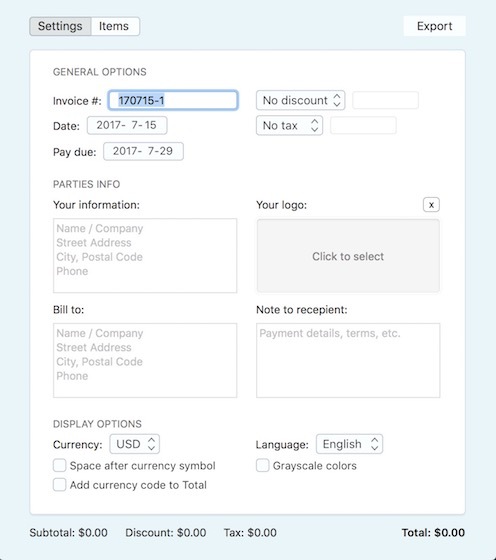 You can even create invoices from right within the app. However, since I am not a freelance worker, I did not use this feature of the app. What I used this app was for tracking my time and that it does perfectly. Again, you will be surprised to see how much time you waste without even knowing it. Tracking the time you spend on your Mac can really help you in deducing where your time is spent. You might feel that you were working the whole day but your stats tend to say otherwise. 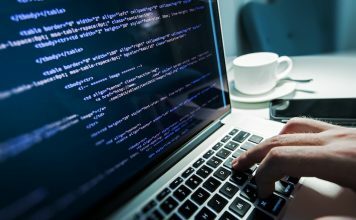 Look, no one can be a 100% productive all the time and that is not the goal of using these apps. The goal is to figure out where you are wasting your time and then figuring out a way to minimise it as much as possible. It’s time to stop lying to ourselves and take control of our time. These tools have helped me a lot and I am sure they are going to help you too. Use them and drop your productivity score for the first day in the comment section below.